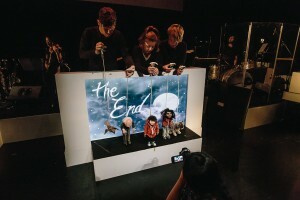 I’m a huge fan of mixed media and was intrigued to see how this adaptation of Peter and the Wolf would work using puppets, a live orchestra and a live feed on a cinema screen. The production was originally created in 1936 to teach young children about the different instruments in the orchestra, with each instrument representing a character. Sergei Prokofiev’s classic has been adapted by Sophie Roberts and Leon Radojkovic and they’ve taken the original concept and taken it further as a means to introduce young people to the theatre by using puppets, animation and a six-piece band instead of an orchestra. It worked very well, the execution of the concept flowed without a hitch and congratulations to the puppeteers, musicians, and camera operators for a flawless performance juggling camera feeds, lighting, puppets, backdrops all while staying in time with the music! The story itself is very simple, focusing on Peter and his isolation in a new home in Auckland central (instead of rural Russia), packed with lots of local references (who knew wolves liked feijoas?). The story travels from Old Mill Road in Grey Lynn to Karangahape Road and Auckland Zoo. It was a sweet and charming production, and I particularly liked the production design of the artwork and backgrounds with their hand-drawn feel. In the first of a rotating cast of narrators, Thomas Sainsbury (currently a Snapchat political impersonator sensation) provided the voice of the play and did an excellent job while having fun with the story. Apart from the odd struggle to be heard above the band, he rose to the occasion and gave a flawless delivery. The list of narrators is a who’s who of Auckland theatre, comedy and politics including Stephen Lovatt, Nic Sampson, Chloe Swarbrick, Michael Hurst and Jennifer Ward- Lealand – with more still to be announced – but the biggest has to be Prime Minister Jacinda Ardern on 19th November. Silo’s Peter and the Wolf is a sweet bedtime story beautifully brought to life through a successful creative collaboration featuring puppets, creative design and lighting, music and animation. The show’s a homage to a simpler time and I hope children these days haven’t got too immersed in their iPads and frenetically-paced cartoons to appreciate a good story told well. Peter and the Wolf plays at the Herald Theatre until Saturday, December 9. Tuesday & Wednesday@ 6 pm; Thursday – Saturday @ 7pm and Sunday @ 4pm. Matinee: 18 & 25 November at 2pm.